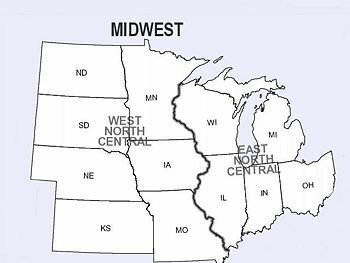 The Midwestern United States (or Midwest) refers to the north-central states of the United States of America, specifically Illinois, Indiana, Iowa, Kansas, Michigan, Minnesota, Missouri, Ohio, Nebraska, North Dakota, South Dakota, and Wisconsin. A 2006 Census Bureau estimate put the population at 66,217,736. Both the geographic center and the population center of the contiguous United States are in the Midwest. 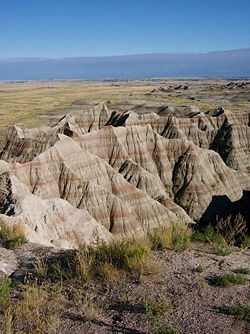 The Census Bureau divides this region into the East North Central states (essentially the Great Lakes states); and the West North Central states (essentially the Great Plains states), although Minnesota, which is listed among the West North Central states, is not listed as a Great Plains state. Chicago is the largest city in the region, followed by Detroit and Indianapolis. Other important cities in the region include: Cincinnati, Cleveland, Columbus, Des Moines, Kansas City, Madison, Milwaukee, Minneapolis, Omaha, St. Louis, and Wichita. In the early nineteenth century, anything west of the Mississippi River was considered the West, and the Midwest was the region west of the Appalachians and east of the Mississippi. In time, some users began to include Minnesota, Iowa and Missouri, and with the settlement of the western prairie, a new term, "Great Plains States," was used for the row of states from North Dakota to Kansas. Today, the term "Far West" means the West Coast. Regional definitions vary from source to source. The states shown in dark red are usually included, while all or portions of the striped states may or may not be considered part of the Midwestern United States. Kentucky and West Virginia are generally included in the South, and Pennsylvania is usually included in the Mid-Atlantic, but regions of these states are often included in the Midwest in maps, descriptions, and cultural delineations. 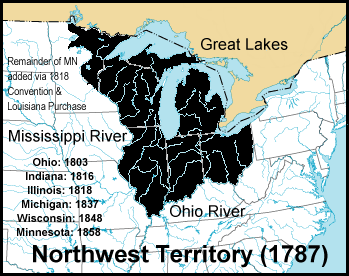 Traditional definitions of the Midwest include the Northwest Ordinance "Old Northwest" states and many states that were part of the Louisiana Purchase. The states of the Old Northwest are also known as "Great Lakes states." Many of the Louisiana Purchase states are also known as Great Plains states. Illinois: Old Northwest, Ohio River, and Great Lakes state. Indiana: Old Northwest, Ohio River, and Great Lakes state. Iowa: Louisiana Purchase, Great Plains state. Kansas: Louisiana Purchase, Border state, Great Plains state. Michigan: Old Northwest and Great Lakes state. Minnesota: Old Northwest and Great Lakes state; western part Louisiana Purchase. Missouri: Louisiana Purchase, Border state, Great Plains state. Nebraska: Louisiana Purchase, Great Plains state. North Dakota: Louisiana Purchase, Great Plains state . Ohio: Old Northwest (Historic Connecticut Western Reserve), Ohio River, and Great Lakes state. Also a Northeastern Appalachian state in the southeast. South Dakota: Louisiana Purchase, Great Plains state. Wisconsin: Old Northwest and Great Lakes state. Konza Prairie, in the Flint Hills section of Kansas. These states are generally perceived as being relatively flat. That is true of several areas, but there is a measure of geographical variation. In particular, the eastern Midwest lying near the foothills of the Appalachian Mountains, the Great Lakes Basin, and northern parts of Wisconsin, Minnesota, and Iowa demonstrate a high degree of topographical variety. 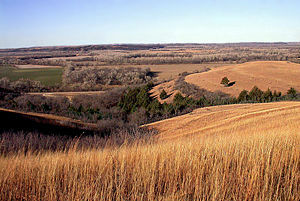 Prairies cover most of the states west of the Mississippi River with the exception of eastern Minnesota, the Ozark Mountains of southern Missouri, and the southern tip of Illinois. Illinois lies within an area called the "prairie peninsula," an eastward extension of prairies that borders deciduous forests to the north, east, and south. Hardwood forests in this area were logged to extinction in the late 1800s. The majority of the Midwest can now be categorized as urbanized areas or pastoral agricultural areas. Areas in northern Minnesota, Michigan, and Wisconsin, such as the Porcupine Mountains and the Ohio River valley, are largely undeveloped. Residents of the wheat belt, which consists of the westernmost states of the Midwest, generally consider themselves part of the Midwest, while residents of the remaining rangeland areas usually do not. Of course, exact boundaries are nebulous and shifting. European settlement of the area began in the seventeenth century following French exploration of the region. The French established a network of fur trading posts and Jesuit missions along the Mississippi River system and the upper Great Lakes. French control over the area ended in 1763, with the conclusion of the French and Indian War. British colonists began to expand into the Ohio country during the 1750s. The royal proclamation of 1763, temporarily restrained expansion west of the Appalachian Mountains but did not stop it completely. Early settlement began either via routes over the Appalachians, such as Braddock Road; or through the waterways of the Great Lakes. Fort Pitt (now Pittsburgh), at the source of the Ohio River, was an early outpost of the overland routes. The first settlements in the Midwest were centered around military forts and trading posts such as Green Bay, Sault Ste. Marie, and Detroit. The first inland settlements via overland routes were in southern Ohio or northern Kentucky, on either side of the Ohio River; among these early pioneers was Daniel Boone. In the American Revolutionary War, Virginia frontiersman George Rogers Clark was able to capture key British forts in the summer of 1778. When General Henry Hamilton, the British commander at Detroit, retook Vincennes, Clark returned in a surprise winter march in February 1779 and captured Hamilton himself. Because the British ceded the entire Northwest Territory to the United States in the 1783 Treaty of Paris, some historians have credited Clark with nearly doubling the size of the original thirteen colonies by seizing control of the Illinois country during the war. The Northwest Territory was created out of the ceded English (formerly French and Native American) frontier lands under the Northwest Ordinance by the Continental Congress just before the U.S. Constitution was ratified. The Northwest Ordinance prohibited slavery and religious discrimination, and promoted public schools and private property, but did not apply after the territories became states. Because the Northwest Territory lay between the East Coast and the then Far West, the states carved out of it were called the "Northwest" in 1789, and "Middle West" by 1898. Following the American Revolution, the rate of settlers coming from the eastern states increased rapidly. In the 1790s, Revolutionary War veterans and settlers from the original states moved there in response to federal land grants. The Ulster-Scots Presbyterians of Pennsylvania (often through Virginia) and the Dutch Reformed, Quakers, and Congregationalists of Connecticut were among the earliest pioneers to Ohio and the Midwest. The region's fertile soil made it possible for farmers to produce abundant harvests of cereal crops such as corn, oats, and, most important, wheat. In the early days, the region was soon known as the nation's "breadbasket." 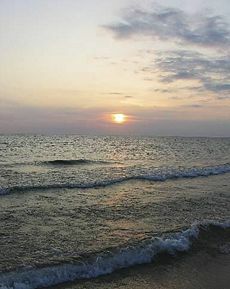 Lake Michigan is bordered by four Midwestern states: Michigan, Indiana, Illinois, and Wisconsin. Two waterways have been important to the Midwest's development. The first and foremost was the Ohio River which flowed into the Mississippi River. Spain's control of the southern part of the Mississippi and refusal to allow the shipment of American crops down the river blocked development of the region until 1795. The second waterway is the network of routes within the Great Lakes. The opening of the Erie Canal in 1825, completed an all-water shipping route, more direct than the Mississippi, to New York and the seaport of New York City. During the Industrial Revolution, the lakes became a conduit for iron ore from the Mesabi Range of Minnesota to steel mills in the Mid-Atlantic States. The Saint Lawrence Seaway later opened the Midwest to the Atlantic Ocean. Inland canals in Ohio and Indiana constituted another great waterway, which connected with the Great Lakes and Ohio River traffic. The canals in Ohio and Indiana opened so much of Midwestern agriculture that it launched a population and economic boom. The commodities that the Midwest funneled into the Erie Canal contributed to the wealth of New York City, which overtook Boston and Philadelphia. New York State would proudly boast of the Midwest as its "inland empire;" thus, New York would become known as the Empire State. Because the Northwest Ordinance region was the first large region of the United States to prohibit slavery (the Northeastern United States only emancipated slaves in the 1830s), the region remains proud of its free pioneer heritage. Its southern boundary was the Ohio River, the border of freedom and slavery in American history. The Midwest, particularly Ohio, provided the primary routes for the "Underground Railroad," whereby Midwesterners assisted slaves to freedom from their crossing of the Ohio River through their departure into Canada. Historically, Kansas held a pivotal position in the slavery issue of the nineteenth century. Whether it chose to enter the Union as a free-state or a slave-state would effect the course of the entire nation. Holding this sway, it became a hotbed of violence prior to the Civil War, a place and era known as Bleeding Kansas. It entered the Union as a free state in 1861. Less than 100 years later, Brown v. Board of Education of Topeka inspired a Supreme Court ruling which outlawed racial segregation in schools. The region was shaped by the relative absence of slavery (except for Missouri), pioneer settlement, education in one-room free public schools, and democratic notions brought with American Revolutionary War veterans, Protestant faiths, and experimentation, and agricultural wealth transported on the Ohio River riverboats, flatboats, canal boats, and railroads. By the time of the American Civil War, European immigrants bypassed the East Coast of the United States to settle directly in the interior: German Lutherans and Jews to Ohio, Wisconsin, Illinois, and eastern Missouri; Swedes and Norwegians to Wisconsin, Minnesota, and northern Iowa. Poles, Hungarians, and German Catholics and Jews founded or settled in Midwestern cities. Many German Catholics also settled throughout the Ohio River valley and around the Great Lakes. The Midwest was predominantly rural at the time of the Civil War, dotted with small farms across Ohio, Indiana, and Illinois, but industrialization, immigration, and urbanization fed the Industrial Revolution, and the heart of industrial progress became the Great Lakes states of the Midwest. German, Scandinavian, Slavic, and African-American immigration into the Midwest continued to bolster the population there in the nineteenth and twentieth centuries. Generally the Midwest remains a predominantly Protestant region. Large concentrations of Catholics are found in larger metropolitan areas because of German, Irish, Italian, and Polish immigration before 1915, and Mexican-American migration since the 1950s. Amish farm settlements are found in northern Ohio, northern Indiana, and central Illinois. In the twentieth century, African-American migration from the Southern United States into the Midwestern states changed Chicago, St. Louis, Gary, Detroit, and many other cities dramatically, as factories and schools enticed families by the thousands to new opportunities. Chicago is the largest city in the Midwest. 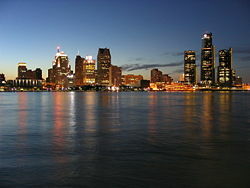 Detroit is the busiest commercial border crossing in North America. Factors that probably affected the shaping of Midwest values include the religious heritage of the abolitionist, pro-education Congregationalists to the stalwart Calvinist heritage of the Midwestern Protestants, as well as the agricultural values inculcated by the hardy pioneers who settled the area. The Midwest remains a melting pot of Protestantism and Calvinism, mistrustful of authority and power. While some point to the small towns and agricultural communities in Kansas, Iowa, the Dakotas, and Nebraska of the Great Plains as representative of traditional Midwestern lifestyles and values, others would assert that the declining Rust Belt cities of the Great Lakes, with their histories of nineteenth and early twentieth century immigration, manufacturing base, and strong Catholic influence, are more representative of the Midwestern experience. Because of African-American migration from the South, a large African American urban population lives in most of the region's major cities, although the concentration is not nearly as large as that of the Southern United States. The combination of industry and cultures, jazz, blues, and rock and roll led to an outpouring of musical creativity in the Midwest, including new music like the Motown Sound and techno from Detroit and house music and the blues from Chicago. Catholicism is the largest single religious denomination in the Midwest, varying between 19 and 29 percent of the state populations. Baptists compose 14 percent of the populations of Ohio, Indiana, and Michigan, up to 22 percent in Missouri, and down to 5 percent in Minnesota. Lutherans peak at 22-24 percent in Wisconsin and Minnesota, reflecting the Scandinavian and German heritage of those states. Pentecostal and charismatic denominations have few adherents in the Midwest, ranging between 1 and 7 percent (although the Assembly of God began in lower Missouri). Judaism and Islam are each practiced by 1 percent or less of the population, with slightly higher concentrations in major urban areas. Those with no religious affiliation make up 13-16 percent of the Midwest's population. The accents of the region are generally distinct from those of the South and many urban areas of the American Northeast. The accent of most of the Midwest is considered by many to be "standard" American English. In some regions, particularly the farther north into the Upper Midwest one goes, a definite accent is detectable, usually reflecting the heritage of the area. For example, Minnesota, western Wisconsin, and Michigan's Upper Peninsula have strong Scandinavian accents, which intensifies as one travels north. Michigan accents closely resemble Canadian ones across the border. Many parts of western Michigan have a noticeable Dutch-flavored accent. Also, residents of Chicago are recognized as having their own distinctive nasal accent, with a similar accent occurring in parts of Wisconsin, Michigan, northern Indiana, Cleveland, and western New York State. Arguably, this may have been derived from heavy Irish, German, Polish, and Eastern European influences in the Great Lakes region. The most southern parts of the Midwest show distinctly southern speech patterns. Tilted beds of the Middle Precambrian Thompson Formation in Jay Cooke State Park, Minnesota. Beginning of spring in Wisconsin. The Mackinac Bridge, a five-mile span connecting Michigan's two peninsulas. 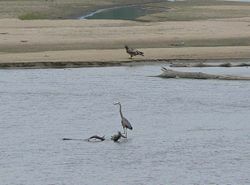 A Great Blue Heron and immature Bald Eagle on the Platte River in Nebraska. Midwestern politics tends to be cautious, but the caution is sometimes peppered with protest, especially in minority communities or those associated with agrarian, labor, or populist roots. This was especially true in the early twentieth century when Milwaukee was a hub of the socialist movement in the United States, electing three socialist mayors and the only socialist congressional representative (Victor Berger) during that time. The urban Great Lakes region tends to be the most liberal area of the Midwest, and the liberal presence diminishes gradually as one moves south and west from that region into the less-populated rural areas. The Great Lakes region has spawned people such as the La Follette political family, labor leader and five-time Socialist Party of America presidential candidate Eugene Debs, and Communist Party leader Gus Hall. Minnesota in particular has produced liberal national politicians Walter Mondale, Eugene McCarthy, and Hubert Humphrey, as well as protest musician Bob Dylan. One of the two major political parties in the United States, the Republican Party, originated partially in the Midwest. One of its founding places was Jackson, Michigan, or Ripon, Wisconsin, in the 1850s and its origin included opposition to the spread of slavery into new states. Most of the rural Midwest is considered a Republican stronghold to this day. From the American Civil War to the Great Depression and World War II, Midwestern Republicans dominated American politics and industry, just as Southern Democrat farmers dominated antebellum rural America and as Northeastern financiers and academics in the Democratic Party would dominate America from the Depression to the Vietnam War and the height of the Cold War. As the Midwest's population shifted from the countryside to its cities, the general political mood moved to the center, and the region is now home to many critical swing states that do not have strong allegiance to either party. Upper Midwestern states, such as Illinois, Minnesota, Wisconsin, and Michigan have proven reliably Democratic, while even Iowa has shifted toward the Democrats. Normally a Republican stronghold, Indiana became a key state in the 2006, mid-term elections, picking up three House seats to bring the total to five Democrats to four Republicans representing Indiana in the U.S. House. The state government of Illinois is currently dominated by the Democratic Party. Both of Illinois's senators are Democrats and a majority of the state's U.S. representatives are also Democrats. Illinois voters have preferred the Democratic presidential candidate by a significant margin in the past four elections (1992, 1996, 2000, 2004). The same is true of Michigan and Wisconsin, which also have a Democratic governor and two Democratic senators. Iowa is considered by many analysts to be the most evenly divided state in the country but has leaned Democratic for the past fifteen years or so. Iowa has a Democratic governor, a Democratic senator, three Democratic congressmen out of five, has voted for the Democratic presidential candidate in three out of the last four elections, (1992, 1996, 2000). As of the 2006 midterms elections, Iowa has a state legislature dominated by Democrats in both chambers. Minnesota voters have chosen the Democratic candidate for president longer than any other state. Minnesota was the only state (along with Washington, D.C.) to vote for Walter Mondale over Ronald Reagan in 1984 (Minnesota is Mondale's home state). In Iowa and Minnesota, however, the recent Democratic pluralities have often been fairly narrow. Minnesota has elected and reelected a Republican governor, as well as supported some of the most pro-gun concealed weapon laws in the nation. By contrast, the Great Plains states of North Dakota, South Dakota, Nebraska, and Kansas have been Republican strongholds for many decades. These four states have gone for the Republican candidate in every presidential election since 1940, except for Lyndon B. Johnson's landslide over Barry Goldwater in 1964. However, North Dakota's congressional delegation has been all-Democratic since 1987, and South Dakota has had at least two Democratic members of Congress in every year since 1987. Nebraska has elected Democrats to the Senate and as governor in recent years, but the state's House delegation has been all-Republican since 1995. Kansas has elected a majority of Democrats as governor since 1956 and currently has a 2-2 split in its House delegation but has not elected a Democrat to the Senate since 1932. Missouri is considered a "bellwether state." Only once since 1904 has the state not voted for the winner in the presidential election, in 1956. Missouri's House delegation has generally been evenly divided between Democrats and Republicans, with the Democrats holding sway in the large cities at the opposite ends of the state, Kansas City and St. Louis, and the Republicans controlling the rest of the state. Missouri's Senate seats were mostly controlled by Democrats until the latter part of the twentieth century, but the Republicans have held one or both Senate seats continuously since the 1976 elections. Around the turn of the twentieth century, the region also spawned the Populist Movement in the Plains states and later the Progressive Movement, which largely consisted of farmers and merchants intent on making government less corrupt and more receptive to the will of the people. The Republicans were unified anti-slavery politicians, whose later interests in invention, economic progress, women's rights and suffrage, freedman's rights, progressive taxation, wealth creation, election reforms, temperance, and prohibition eventually clashed with the Taft-Roosevelt split in 1912. Similarly, the Populist and Progressive Parties grew intellectually from the economic and social progress claimed by the early Republican Party. The Protestant and Midwestern ideals of profit, thrift, work ethic, pioneer self-reliance, education, democratic rights, and religious tolerance influenced both parties despite their eventual drift into opposition. The Midwest has long mistrusted Northeastern elitism. Some favor isolationism, a belief held by George Washington that Americans should not concern themselves with foreign wars and problems. It gained much support from German-American and Swedish-American communities, and leaders like Robert La Follette, Robert A. Taft, and Colonel Robert McCormick, publisher of the Chicago Tribune. Unemployment remains low but is higher than the national average; some manufacturing-dependent states—most notably Michigan—have still higher unemployment rates. Outsourcing of higher paying manufacturing jobs and a rise in low-wage service jobs is a major issue. ↑ John Henry Garland, The North American Midwest a Regional Geography (Wiley, Chapman & Hall, 1955). 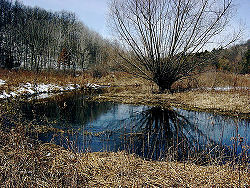 ↑ U.S. Geological Survey, Amphibian Research and Monitoring Initiative: Midwest Region Retrieved December 17, 2007. ↑ U.S. Census Bureau, Incorporated Places of 100,000 or More Ranked by Population:2000 (pdf). Retrieved November 20, 2007. ↑ U.S. Census Bureau, Population in Metropolitan and Micropolitan Statistical Areas Ranked by 2000 Population for the United States and Puerto Rico: 1990 and 2000 (pdf). Retrieved November 20 2007. ↑ Ralph H. Smuckler, "The Region of Isolationism," American Political Science Review, Vol. 47, No. 2 (Jun., 1953): 386-401. Buley, R. Carlyle. The Old Northwest: Pioneer Period 1815-1840. 1951. Cayton, Andrew R.L. Midwest and the Nation. 1990. Cayton, Andrew R.L. and Susan E. Gray (eds.). The American Midwest: Essays on Regional History. 2001. Frederick, John T. (ed.) Out of the Midwest: A Collection of Present-Day Writing. 1944. Garland, John H. The North American Midwest: A Regional Geography. 1955. Jensen, Richard. The Winning of the Midwest: Social and Political Conflict, 1888-1896. 1971. Meyer, David R. Midwestern Industrialization and the American Manufacturing Belt in the Nineteenth Century, The Journal of Economic History, 49(4). Shannon, Fred A. "The Status of the Midwestern Farmer in 1900." The Mississippi Valley Historical Review, 37(3): 491-510. Sisson, Richard, Christian Zacher, and Andrew Cayton (eds.). The American Midwest: An Interpretive Encyclopedia. Indiana University Press, 2006. ISBN 0-253-34886-2. History of "Midwestern United States"
This page was last modified on 7 October 2013, at 15:03.